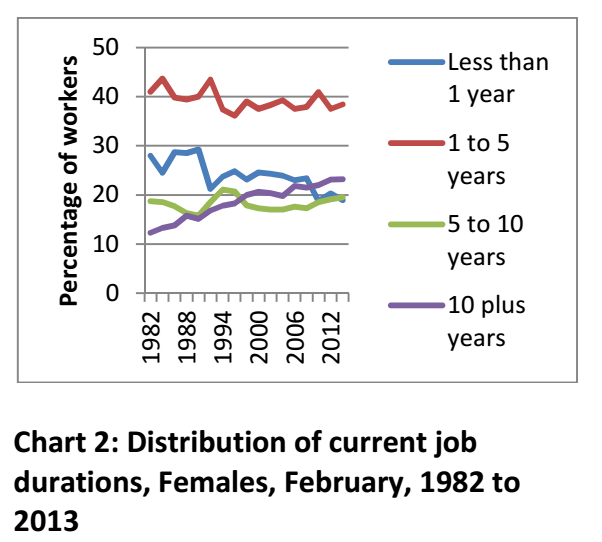 A fact you never guessed about our 21st century, hyper-speed labour market. We live in a new era. A time unprecedented. An age where the economy shifts as fast as you can send ones and noughts along optical fibre, and the job you’ll have in five years time hasn’t even been invented yet. Right? My favourite labour economist is Jeff Borland, and he specialises in truth bombs, which he distributes in his monthly labour market snapshots. I’ve written them up before, for example, here. He crunched the numbers and found that despite the decline of unions, the march of neo-conservatism, the lingering influence of Peter Reith and the legacy of workchoices, job durations are as long as – or longer than – they were in 1982. For the last dozen years (at least), he’s been a professor of Economics at Melbourne University, so he knows tenure. In that time I’ve had probably ten jobs, so this news is very surprising to me. What else is interesting is that people feel (and are) relatively safe in their jobs. I suspect they feel even safer since the Abbott government started polling about as well as the Gillard goverment. The chances of frightening workplace reform coming out before the next election would have to be slim to nil given the reputation of the government right now. Previous Previous post: Who thinks the ice-bucket challenge is over? Next Next post: My HECS debt is finally gone!